The National Hurricane Center advisory at 11 a.m. listed Florence as a Category 3 storm, with winds of 115 mph. That’s the threshold for major hurricanes. A hurricane hunter aircraft passed through at noon, however, and found Florence had winds of 130 mph, making it a Category 4 storm. 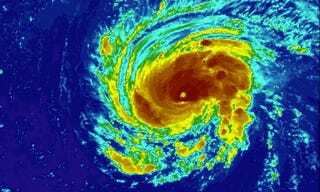 Forecasts indicate Florence will continue to undergo rapid intensification, a meteorological term for when a storm see sustained winds increase at least 35 mph over a 24-hour period. 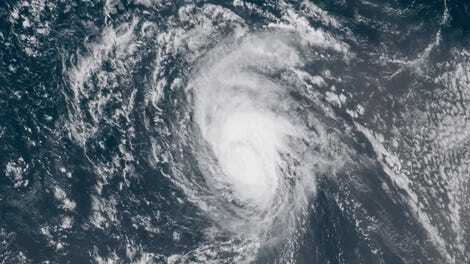 “Further strengthening is anticipated, and Florence is expected to be an extremely dangerous major hurricane through Thursday,” the National Hurricane center wrote in its Monday morning update. The unfortunate forecast is due to a few factors. All weekend, Florence had strong upper level winds that kept it from really being able to wind up. But those winds have since slackened and Florence’s structure has become much more stable from Sunday night into Monday. 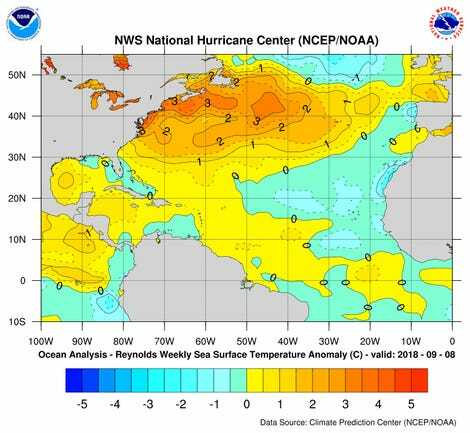 Weekly sea surface temperature departure from normal in the Atlantic. Whatever the role the AMO and climate change play in influencing Florence, the impacts of the storm will likely be acute and potentially deadly. The storm is expected to smash into the East Coast by late Thursday delivering powerful surge, winds, and torrential rains. If you live anywhere between Georgia and New Jersey, pay very close attention to the forecast in the coming days.